I think the new shoes have done the trick. 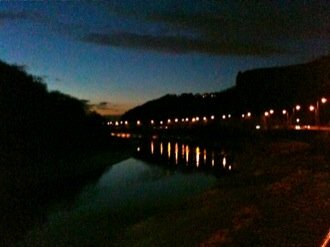 Something has, anyway, as tonight’s run was lots better than my last 5K effort down the Portway. My hip feels fine, and I didn’t feel totally knackered from the get‐go like I did last time, either. Which is all good. Even better, there were actually some traces of daylight left when I set out. It can only be a few weeks until I can get off the A4 and back onto the towpath on the other side of the river, away from the traffic and all the noise and fumes that go with it. Tonight I used a playlist generated by Tangerine. I like Tangerine‐ and iTunes Genius‐generated lists because they uncover things I never knew were in my music library. This evening was no exception. There were some old favourites in there — although I really should put Madness’s Driving in My Car on the “not really for jogging” blacklist — but I had no idea that I even owned Madonna’s Love Profusion, Soft Cell’s Le Grand Guignol, or Placebo’s cover of Daddy Cool. Back to recognisable stuff, my run finished off with a nice back‐to‐back blast from the 1980s, with the Pet Shop Boys’ It’s a Sin and One More Chance. I love It’s a Sin, but I was probably in my teens the last time I heard One More Chance… Ah, nostalgia. Anyway. Probably won’t run on Friday, so I guess Saturday will be my next jog; then I might try to get out on Monday and Thursday next week to get back to my more normal three‐times‐a‐week routine. Especially if it’s nice and light!